Fans of usc claim that it is NOT just a glorified Obedience School, and, it turns out that they are right: It isn’t glorified at all. In fact, calling it that would constitute an insult to Lassie, Rin Tin Tin, Won Ton Ton, Benji, Eddie from Frasier, and maybe even Scooby Doo. Someone call Dog The Bounty Hunter — For the FOURTH time in the past month, a trOJan from Snoop Dogg U. has been accused of defying Police instructions, and basically obstructing Justice. Tennessee Titan Running Back LenDale White is the most recent perp, cited after 2 in the morning, at a Party in Denver that was being held in his honor. Details are sketchy, but White is facing punishment basically for being a jerk to the Officers, and for property damage that occurred. He probably refused to turn down his music, and then threw a can of Colt 45 at the windshield of a Police Car – missing it, and hitting a neighbor’s Poodle instead. 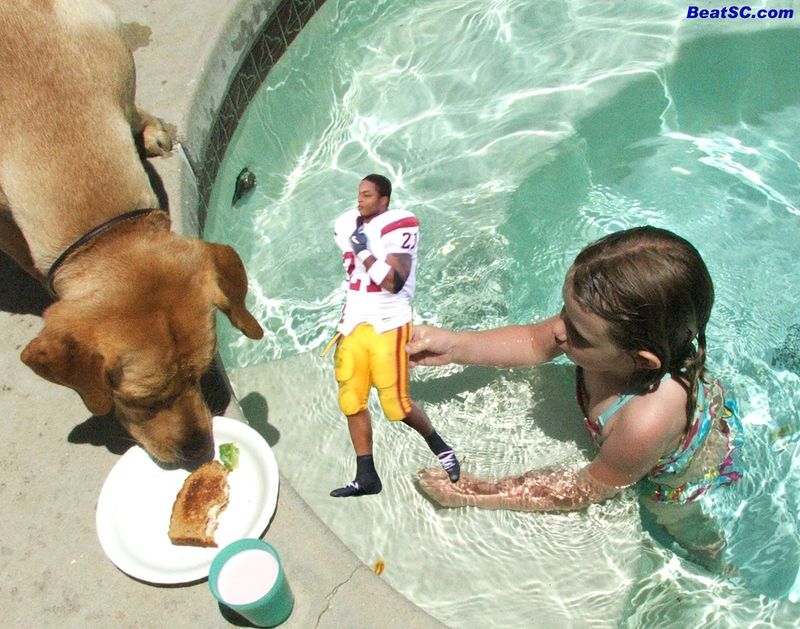 It is usc’s disrespect for Justice that, in part, caused us to start this site in the first place, especially in terms of trojans glorifying O.J. Simpson, and not wanting him to get what’s coming to him. The most famous pertinent trojan quote is “We own the LAPD.” All trojans feel that they are above-the-law, and that the rules don’t apply to them. Take Tim Floyd, Pete Carroll, and Reggie Bush, for instance. So it’s no surprise when a trojan or ex-trojan breaks the law and ignores the verbal orders of a Cop. But when four of them do it all at the same time – and get caught – well, THAT’S News. What would also be News is if ANY of them EVER paid any consequences. Fili Moala, an sc Defensive Tackle who was accused of blowing off explicit commands by Newport Beach Police, and of entering a Crime Scene and fight, was already “cleared,” NOT due to any proof of his innocence, but thanks to the classic trojan Defense “Lack of Sufficient Evidence.” That means that the Cops still say that he acted like a thug, but that they can’t get anyone from his posse to back them up. Something similar is bound to happen with the trojan Recruit who got pinched for some sort of armed robbery scenario, with Dwayne Jarrett (DWI), and with White, so that all of them get off completely unscathed, so that they can all enter the O.J. Simpson Invitational Golf Pro-Am, with SOME proceeds going to look for the REAL Robber, Drunk Driver, and Justice Obstructors. "Another Obedience SChool Dropout" was published on March 18th, 2008 and is listed in News from the Dark Side. 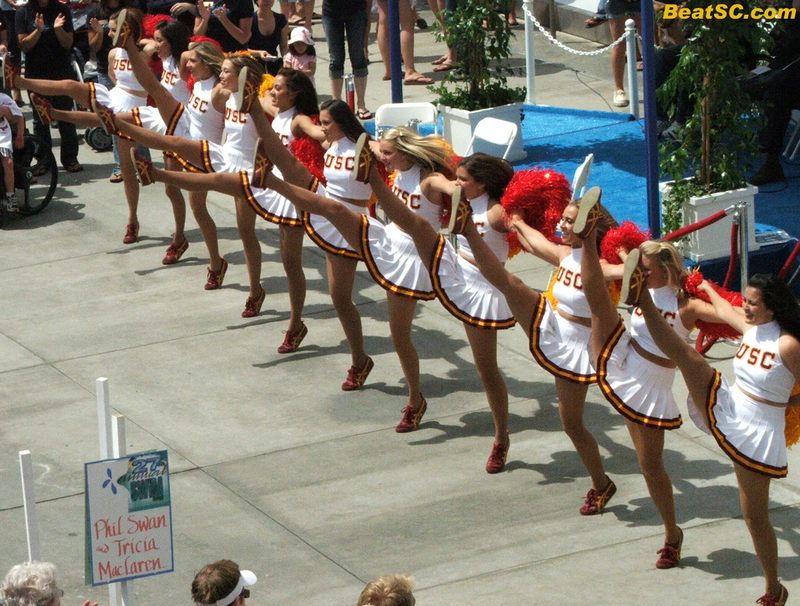 I certainly don’t want to be mean in any way, but in looking at these usc cheerleaders – after you see the UCLA cheer squads, I almost feel sorry for these usc girls as they don’t match up very well to UCLA’s. One of these days SOON our football team will also be better than theirs. insult to scooby doo…..colt 45 throwing – LOVE IT!